Feminine Entrepreneurs building and achieving success while staying true to the passions of her Essence! She is the face of the new Feminine Leader. She holds the torch for women, lighting the way, so they may find their passions. She is audaciously authentic, approachable, and available. Her presence is seen and heard among the many, her message is clear. She remembers a magical moment when the truth of her legacy appeared, and she embraced the power of her presence that would in turn help ... See More other women do the same. 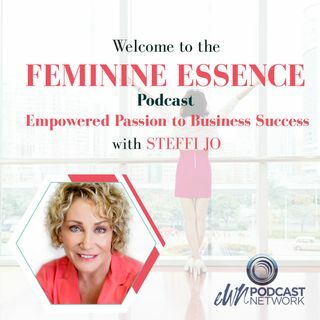 Join Steffi Jo as she shares conversations with these remarkable women who tell us of their personal journeys of transformation, growth, discovery, success and stepping into the full expression of their unique Essence! Are you on a Journey to Empowerment? Conversation with a Fashion Stylist! How do you rate your confidence level? Grace Lanni_Are you clear about your brand? How do You Create Harmony in Your Environment? Love Yourself Successful – is this the missing link? What is the most powerful question you can ask? Loving Yourself First – Is it “selfish”?